Mittal’s contemporary from IIT Kanpur and current bridge partner, Umesh Rakhra, still remembers how Mittal brought him some kiwis from New Zealand long before they were fashionable in India. Bala Mahadevan, president, Computer Sciences Corp. India, recollects how he first discovered raw haldi when Mittal was his boss at Digital-HP. Garden-fresh, the root was bottled by Mittal’s wife, Vidhu, an expert cook who has taught vegetarian world cuisine to several thousand students over the last 15 years. The pickle recipe is now part of Ghar Ka Khana, her forthcoming book on everyday home food. Friend Abhishek Poddar, managing director of Matheson Bosanquet, and his family delight over Vietnamese candied ginger and Royce chocolates from Japan. “Som’s passion for food and friendship is simply unique. 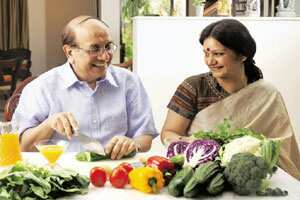 Vidhu and he are Bangalore’s ultimate foodie couple," he says. As the youngest in the family and an only son, Mittal would often help his six sisters in the kitchen, making tea and peeling vegetables. This training came in handy in his last year of metallurgical engineering at IIT Kanpur in 1973 when, as hall rep, he ran the mess for a few days when a workers’ strike threatened to shut down the campus. Mittal and his friends cooked food for 2,000 students daily, and the strike had no effect. He says, “People who never ate at the hostel because they couldn’t bear the food, loved what we dished out." IIM Ahmedabad, where he went on to complete a management degree, was another great place to make friends from diverse backgrounds. Then came the defining turn in Mittal’s learning curve: a decade of working closely with the Japanese, setting up the auto ancillary plant, SRF Denso, in Noida, near New Delhi. Under him, the company became the sole supplier to Maruti, overcoming initial challenges of low power supply, no telex or fax lines. Mahadevan, who was mentored by Mittal for seven years in Digital- HP, says, “Much of Som’s structured working style, his attention to detail, was from the shop floor in Japan, which he admired greatly. At Digital, he stunned us with his neatly written notes and pie charts, in a pre-Excel era." In the early 1980s, Mittal would travel to Japan every month. Once his Japanese colleagues saw the gusto with which he relished sushi and sashimi, they became foodies together. Quite by chance, Mittal stumbled upon an Indian restaurant in Kariya Shi, Nagoya. He chuckles, “The Japanese owner-chef had one curry base, which became prawn curry, egg curry or whatever you wanted. He served puris with it, because he didn’t have a tandoor to make naans." So Mittal rolled up his sleeves, went into the kitchen and made naans in a pressure cooker, teaching him Vidhu’s foolproof method. Colleagues who later visited the restaurant noted the new house speciality on the menu—Mittal’s Naan. And everyone from the company would get a free beer and a discount on the bill. That’s not all. The grateful owner would send jars of wasabi and green tea packets to India; Mittal, in turn, would reciprocate with papads and cloves. And what started off with food slowly distilled into friendship. Two decades later, Mittal says simply, “I learnt how trust can get built and how you can break barriers." In 1994, Mittal infused the same spirit into the Bangalore-based, loss-making, multinational IT company, Digital Equipment, listed in India. After a rapid turnaround, he nurtured it through its successive avatars, into a 11,000-people company which was eventually sold to HP at a handsome value to its shareholders. The well thought-out moves of Mittal’s career path now bring him squarely to the challenging presidentship of Nasscom. Chairman in 2003-04, and member of the executive committee, he’s not new to the organization. Former colleague Bhaskar Pramanik, president, India GEM, Sun Microsystems, points out, “Som can take Nasscom global, bringing in views of players like Sun, IBM, HP and others." Harish Mehta, a co-founder of Nasscom, adds: “In FY08, revenues from the Indian IT industry could touch $50 billion (Rs1.97 trillion). But the challenges are from within: for instance, taxes on rental property, fringe benefits and employee stock options—and rupee appreciation to the dollar. Som’s collaborative style will balance competitive tugs between all the players." So, at Nasscom, Mittal, foodie that he is, will probably take a leaf out of Vidhu’s new cookbook, improvising as he goes along. In an interesting dessert recipe, she combines, among other ingredients, crisp Bangalore apples, colonial Marie biscuits, globally branded, locally made Tropicana Orange juice, blended in with the very desi Gits Gulab Jamun Mix. The result: a delicious, borderless “Crumble", part gulab jamun, part tarte tatin leaning towards apple pie. Its low-cal, nutritious crunch simply hits the spot.